If you go to the ‘iTunes:Preferences’ menu and click on ‘Advanced’ then ‘Importing’ you will see some options like ‘Import Using’ and ‘Setting’. 1. Why does Apple allow me to use different formats like AAC and MP3? Which one is better? 2. How good is the default setting of 128kbps (high quality) (See picture below – click to enlarge). Unfortunately I assumed the defaults were the best, so I used the built in defaults in iTunes to import my entire CD collection. 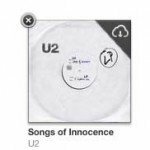 But if you listen carefully to your iPod through your stereo, and compare it to a CD, you will hear a significant difference in audio quality at 128kbps. It’s not that listening at 128kbps sounds really bad, but if you compare it to the original, you will notice that it’s different. It’s not as clear and some details are missing. 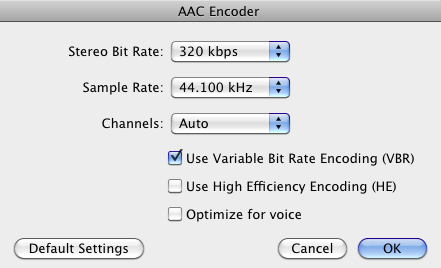 Best Bit-rate for compressed audio – 320kbps. If you want better quality music you should use a higher bitrate than 128kbps. When Apple first launched iTunes the songs on the store were encoded at 128kbps, but from 2010 even Apple now use 256kbps on the iTunes store which is an immense improvement. The difference between Apple’s upgrade of 128kbps and 256kbps is very noticeable and it is worth upgrading all your existing iTunes purchases, but 256kbps is not as good as 320kbps though, so if you have a CD I recommend importing at 320kbps if you choose to import as AAC. When this article was first written in 2008 I suggested 320kbps AAC as the best setting. 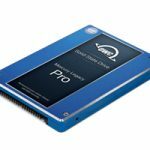 There have been significant increases in hard drive size in that time and hard drives are now large enough to easily cope with the size of Apple Lossless files. 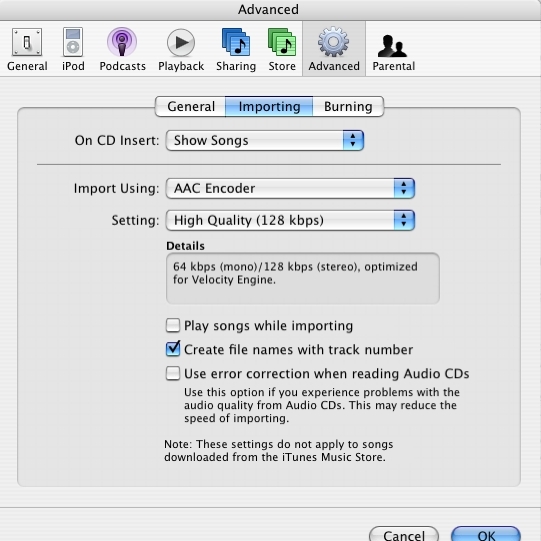 I now suggest you use Apple Lossless Encoder for all importing of songs from CD. It gives the best possible quality. 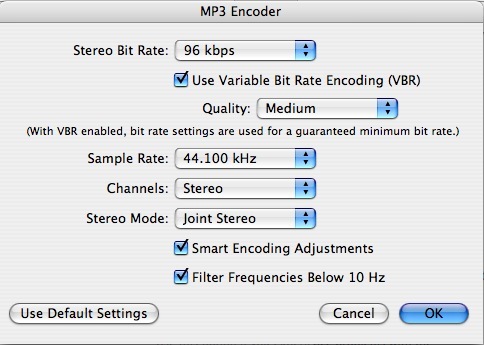 I now recommend the Apple Lossless Encoder as the best way to import your CDs for general use. (I’ve written about it here.) It compresses an audio file without any deterioration in audio quality at all. So why does iTunes allow lower settings? Well, a lower setting will give a smaller file, so in the days of small iPods and small hard drives it was necessary to have very small music files. But if you want good quality sound it’s better to go with a higher setting. 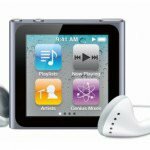 If you do have one particular iPod or iPhone that is a bit small and you don’t want to fill it up with Apple lossless files, there is a setting that you can set independently for each iPod that will reduce the file size just for that iPod. You can change the settings for a particular iPod to put lower quality files on it to save space, but still have the Apple lossless files on your computer . Just tick the ‘Convert higher bit rate songs’ box. You can find it under the settings tab that appears when you plug the iPod in – it is the bottom box in the picture below. This can be turned on or off independently for each device that you have. 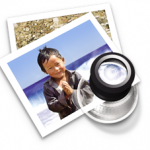 What are the differences in file size? There is an option that says ‘Use error correction when reading audio CDs’. You should always have this option ticked. It will improve the quality of the resulting audio. The way information is written to an Audio CD is different to a CD-ROM, and so it is possible to read audio from a CD imperfectly. This setting helps avoid mistakes when reading the audio from a CD. 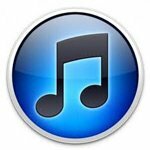 How to import a song at high quality into iTunes using just iTunes. 1. Open iTunes, on the iTunes menu select Preferences. Then on the general tab select Import Settings. 3. Select 320kbps. Sample rate can be auto or 44.1 VBR doesn’t matter really. 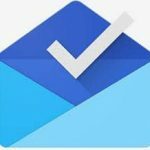 The file may be smaller if you use VBR. Click OK and import a CD as usual. If you are low on space pick out some of your least favourite CD’s and encode them at a lower quality! 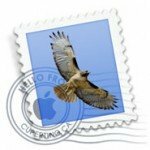 Relates articles: Importing into iTunes using LAME. I just found this fantastic article by Marc Heijligers on compression and although now very old, it would backup that LOSSLESS IS BEST, or at least 320kbps if you must use compression. I found the 255 error was because I was only changing the cache location, not the ultimate mp3 file destination and the last-used location was on a drive that was not connected. How can I tell what bit rate any one particular song was compressed to? (I don’t think I’m wording this right.) But let’s say I ripped a bunch of CDs to iTunes. Started with 256 then changed to Lossless. Where can I find that info for a song? If it’s 256 you can see the bitrate in iTunes, or click on the audio file and ‘Get Info’. But if you stared with 256 then changed to lossless there’s no way to know that it was originally 256. There’s no history information in an audio file to tell you whats been done to it in the past. Thank you, Wayne. Okay, I think I’m understanding this more. All my music so far is at 256 (iTunes Plus), but I stopped midway through ripping all my Cds to research this further. I think I may start over and do them all at 320. The reason I’m not keen on the Lossless is because I want them to convert to 320 for the iPod (not to 128). I currently don’t have a serious home system, but when I do get one is it possible to have 2 files for the same song (Lossless for at home & 320 for the ipod in the car)? Am I understanding this correctly? Thanks! After encoding 500+ classical music CD I finally understand I did it all wrong. I now have all together a 100Gig library. Here is my question: How would you recommend I proceed to revamp my library? Can i have 2 libraries for a while and then switch? Also thank you so much for a wonderful article written in a way that ordinary knowledgeable people understand. Presuming the DAC on your MP3 player is as good as your CD player then in blind tests no one can tell the difference above 192kbs VBR. The problem with MP3 was 128Kbs CBR was far from CD Quality as claimed. VBR came along and really helped by providing more bits for the complicated sections and simply upping to 160kbs VBR became very hard to tell the difference. To be safe 192kbs should be fine but Apple had to goto 256kbps for marketing reasons. Thanks for the great info. I was just wondering, I purchased a lot of songs from iTunes. And I just noticed they were mostly in 256kbps. Is there a way to have them re-downloaded at 320kbps or the best quality? Without re purchasing them again? Thanks. 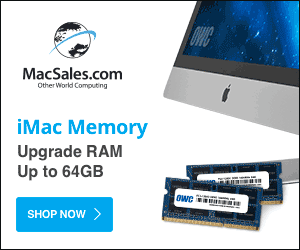 The maximum you can buy on the Apple store is 256 kbps AAC. 256 will be fine for you, 256 is very good! The only way to get higher is to buy a CD and import them. You may try use Avdshare Audio Converter to convert MP3 bitrate step by step guide and also help to change other audio format bitrate or video format bitrate. Cheesdown, Why would you pay $25 for Audio Converter when iTunes does it for free and does a very good job?